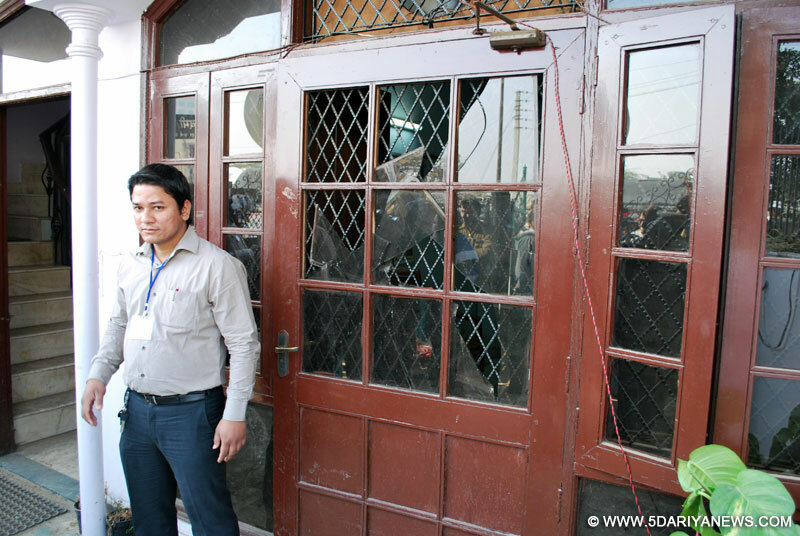 A vandalised Aam Aadmi Party (AAP) headquarters which was attacked by activists of Hindu Raksha Dal -a right-wing group in Kaushambi, Ghaziabad on Jan.8, 2014. Around 40 men said to be from a Hindu group attacked the AAP office here Wednesday, apparently to protest a statement on Kashmir made by party leader Prashant Bhushan, witnesses said.The attackers barged into the Aam Aadmi Party office at Kaushambi, stoned it heavily shattering windows, broke flower pots and abused AAP leaders, Dilip Pandey, an AAP leader who was at the site, told IANS.Before fleeing after some 20 minutes, the attackers threatened to attack AAP leaders in the future too. Pandey said they were from a group called Hindu Raksha Dal. "All our volunteers were asked to get inside (the office) when the attack took place," Pandey said, adding the attackers raised slogans against a particular community.Asked if the arson was a reaction to Bhushan's comments on army deployment in the Kashmir Valley from which the AAP has distanced itself, Pandey said: "It may be possible. "The attackers, in their 20s and 30s, came in four or five cars.The AAP office at Kaushambi is located not far from the personal residence of AAP founder leader and Delhi Chief Minister Arvind Kejriwal. Bhushan, Yadav accuse Kejriwal of "horse trading"